How To Connect Android To PC Via WiFi? There are times when you need to transfer data from your mobile to your PC. Whether it is because your mobile space is running out, or you want to transfer files you downloaded to your mobile to desktop or vice versa, you need to connect the mobile to your PC. Most of the people make use of a data transfer cable (the one which you might be using to charge your phone as well) and transfer data. But do you know that you can make use of your WiFi and transfer data from your mobile to PC? Yes, you can. 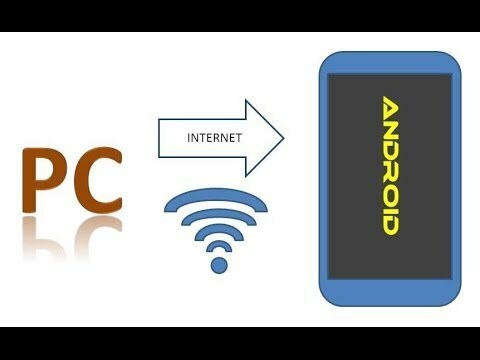 In this article, we will guide you about how to connect android to PC via WiFi. When you talk about the wireless data transfer, you need a source. There are various apps that will let you proceed with this task. However, to make the selection easy for you, here we tell you about 3 best apps that you can use to transfer data. The AirDroid is a free application that let you manage and control your android device from your desktop. A person can use this software to transfer and receive files between his computer and mobile wirelessly. You can send pictures, videos, audio and other files through this method. Even if you want to send the text message from your computer, you can use this app and you will be able to do so. It is perhaps one of the most popular apps for transferring data wirelessly between your android and your PC. The reason is that first of all, the application is available for free and secondly, it is pretty easy to you. You will find the tour at first start of this application that will guide you. This is another application but comes with 2 versions. The first one is free while the other one will cost you $1.40. By the help of this, you can transfer data from many machines to your wireless network. There are certain limitations when you use the free version. For example, using the free version, you will not be able to send the files that are larger than 5MB in size. Therefore, people who find the free version useful but are not able to proceed with their work appropriately due to its restrictions often go on to buy the pro version of it. There are many android file explorers that you will get for your phone but ES File Explorer is a standout. It is because it gives you a chance to make use of File Transfer Protocol and, by that, you can transfer files from your mobile to your PC wirelessly. However, it may be a lengthy method and the one that you might not like at all. This is because using FTP will require some knowledge of networking or you need to watch a tutorial of few minutes before proceeding to use FTP to transfer data from your mobile to your computer wirelessly. So, these are three applications that will come handy for you if you want to connect android to PC via wifi. I hope that this article regarding how to connect android to PC via wifi was helpful for you. Now, you should be able to connect your smartphone to your desktop wirelessly. Just download these applications and start using it. Or if you want, you may explore a bit more before you proceed with one of these methods. If you have any query, you can ask in comments and we will love to reply you!